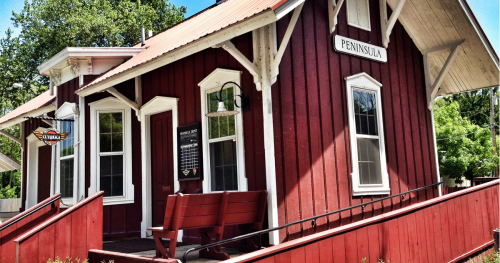 Looking to explore the Village of Peninsula? Purchase a coach ticket which acts as an all-day pass, allowing you to deboard and reboard the train throughout the day. With a coach ticket you can board at Rockside or Akron Northside Station and deboard in Peninsula to explore the area. We’ve mapped out a timeline to help you plan your trip! The timeline below reflects the March and April National Park Scenic schedule which runs on Saturdays and Sundays. Click below for things to do while you’re in Peninsula. 12:40 p.m.—Depart from Peninsula Depot. Train heads south to Akron. If taking this departure out of Peninsula, passengers will see the entire length of the loop.